Many of us are fans of cakes. Some of us are even cake artists that are ready to take on a challenge with other bakers in the Great British Bake Off. Well then, here’s a slot dedicated to those of us who can whip up a scrumptious storm in the oven, to those who love to volunteer as cake testers, and to those who love the TV show! 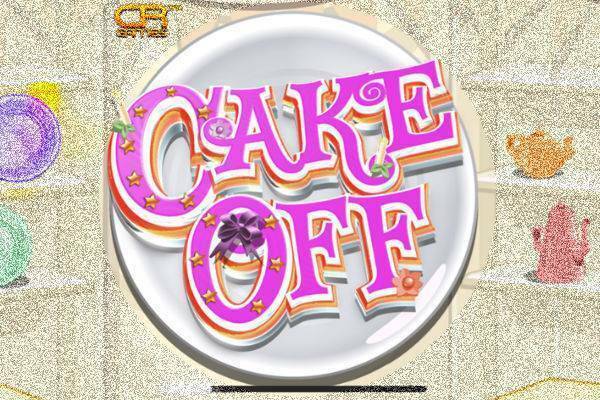 Cake Off is a 5 reel, 10 payline slot from CR Gaming. There’s also a high roller mode that gives you another 10 lines, giving you 20 paylines in total. It’s bright and jolly, featuring extravagant baked goods and a hot bonus game. This game isn’t widely available yet, but you can take a peek into the oven at these trusted slot sites. The great Cake Off is no challenge when it comes to getting started. Adjust your bet size with the “Bet More” and “Bet Less” button, with bets starting at just £0.01 per line and going up to £50. By default, all 10 paylines are active. If you have bit of extra dough on hand, you can choose to switch to High Roller mode – the button is right next to the Spin button, and then it will activate all 20 paylines. There is of course an Auto Play setting that will allow you to sit back and watch the spinning happen by itself. In addition, there’s a Wild, and the Cake Off logo as well as the Jam Tart are Bonus Scatter symbols. The top prize in Cake Off can be won when you spin 5 Fondant Fancies. This will land you 50x your bet. So if your spin was £2, then that’s £100 for you. Next up are the Black forest and the Batternberg; they’re of equal value of 5x of each will land you a cool 25x your bet. That’s £50 if you’re betting £2 a spin. Of course there are more prizes in the bonus game! Cake Off Free Spins: Land 3 or more Cake Off logos, anywhere on the reels, and you’ll trigger the Free Spins feature. 3 Logos will get you 10 free spins, 4 will get you 15 spins, while 5 will get you 20 free spins. Before the feature begins, you’ll choose which cake you think will be voted the winner. When the free spins start, you’ll only see cake and scatter symbols; each cake that appears will multiplied by your bet and get added to the bonus pot. At the end of the free spins, the cake with the highest pot is the winner, and then the pot belongs to you. If by chance you chose the winning cake from the beginning, then the pot is doubled! If you spin a scatter, then it goes towards a Stick or Swap trail. Reaching the end of the trail will give you the possibility to swap for a different cake or stay with the same one. Jam Tart Bonus: Get 3 Jam Tarts and you’ll get a spin on the wheel to win a cash prize. Lucky Respin: This is only available when you play in High Roller mode. Here you just need 2 scatter symbols in view to trigger a re-spin. Gamble Feature: For the audacious and the lucky, the Gamble feature will present you with a wheel from which you can choose a part from the wheel, and if the wheel lands in your part of the wheel, then you win with an extra boost. The larger your part of the wheel, the lower the rewarding boost. The game has a maximum win of “just” £250,000. Cake Off looks like the dream kitchen. The theme features clean, pastel colours, but more importantly, there are beautiful and extravagantly decorated cakes. Even the A, K, Q, and J symbols are pretty like a lavish birthday candle. This game will definitely leave many players inspired for their next adventure in the kitchen, or send the less talented among us to the bakery! If you love cakes and you love to indulge in the decorations, then you might just want to take a look at the Cake Off slot. This is a pretty game, with some nice bonus features on top. The Cake Off Free Spins will get your competitive edge running as you push towards getting your cake to the top to double your winnings. See why so many players are spinning the Cake Off slot at one of our recommended slot sites!